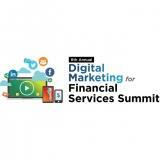 Now in its 9th year, the Annual Digital Marketing for Financial Services Summit is Canada’s premiere source for Marketing innovation in Financial Services. Over 350 professionals will attend this year’s summit in Toronto on June 19th and 20th at the Westin Harbour Castle. The event will tackle topics including the challenges around omni-channel integration, attribution, disruption, automation, content, search and display, social, mobile, and customer experience. The event features over 50 award-winning speakers including Betsey Chung (Senior Vice President & CMO, Canadian Banking at TD Bank Group), John T. Renz (Vice President, Marketing Content & Advertising at Prudential) and David Willows (Chief Innovation and Marketing Officer at Green Shield Canada). Sign up today!! First time out, it was great! Only thing I would say to improve is not something you can fix...couldn't get near many of the higher-up execs attending. Oh well. We still got some great leads out of it.